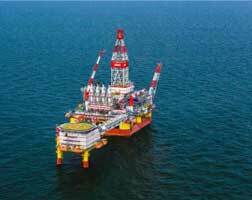 Russian energy corporation, Lukoil (PJSC Lukoil Oil ) has completed construction of the seventh well at production platform number two of Vladimir Filanovsky field as it continues to develop the infrastructure of its fields in the north of the Caspian Sea. Lukoil has pioneered the development of oil and gas reserves at the Russian sector of the Caspian Sea. The newly constructed well has two bores; with the main bore’s drill depth of 3.6 thousand metres. The bottom of the side track is 3.7 thousand metres deep. The field’s current well stock is comprised of thirteen production and two injection wells. With 6.1 million tonnes of oil delivered by Vladimir Filanovsky field in 2018, the total cumulative production of the field has reached 11.5 million tonnes. The third production well has been commissioned at the wellhead platform of Yury Korchagin field. The well is equipped with a state-of-the-art intelligent-completion system with electric drive, which Lukoil said guarantees the most efficient use of the well’s geological potential and minimises geological risks. The current well stock of the field is twenty seven producing and six injection wells. ​In 2018, the field produced 0.81 million tonnes of oil and condensate. In total, 8.8 million tonnes of liquid hydrocarbons have been extracted since the start of production. ​The start of commercial oil production at the Rakushechnoye field, lukoil’s third project in the Caspian Sea, which started in the fall of 2018, is slated for 2023. The planned annual production rate is estimated at 1.2 million tonnes. Meanwhile, Lukoil, together with the Ministry of Energy of the Republic of Kazakhstan and JSC NC KazMunayGas have also forged a contract for the exploration and development of hydrocarbons on the Zhenis block in the Kazakh Sector of the Caspian Sea. Its joint venture with KazMunayGas, the Zhenis Operating LLP, will be operator of the project.